(also Pole beans, Runner beans, Scarlet Runners) Plant in garden. Harvest from November. (also French beans, Bush beans) Plant in garden. Harvest from November. Broccoli Plant in garden. Harvest from November. (also Bell peppers, Sweet peppers) Plant in garden. Harvest from November. Cauliflower Start undercover in seed trays and plant out in 4-6 weeks. Harvest from January. (also Black eye peas) Plant in garden. Harvest from December. Cucumber Plant in garden. Harvest from November. Onion Plant in garden. Harvest from March. Pumpkin Plant in garden. Harvest from December. (also Vegetable oyster) Plant in garden. Harvest from December. (also Crookneck, Pattypan, Summer squash) Plant in garden. Harvest from November. Tomato Plant in garden. Harvest from November. Turnip Plant in garden. Harvest from October. Watermelon Plant in garden. Harvest from November. Sanderson - I'll jump over here to ask you this. OOPS - I was just going to ask you if you were allowed to catch rainwater and use that for your garden, when I remembered that you don't HAVE any rainwater. Duh. But if/when it does rain, can you do that to supplement your watering supply? Well... several of the items listed would freeze just about when they're ready to pick - Pumpkins in December - I DON'T THINK SO, LOL! However, I am getting my seedlings started this week and am planting some things in my greenhouse this year to see if I can coax them through at least the first freeze and into Late dec or jan. I want to try some zucchini in there. I already have a spaghetti squash, cucumbers and my salsa makings going thanks to my shade cover they're all doing well. NHG - So far, there isn't any regulation against catching water. I have a small backyard so rain barrels are out. Besides, it would have to rain really hard to clean off the roof of the sticky pollution buildup before collecting any. We used to get 8-10" of rain annually, but we have been in a severe drought. The water level has dropped so wells have to be deepened, etc. Mountain rain/snow water is not ours, necessarily. Most gets sent to the San Francisco area. Just water politics. We have to buy canal water and treat it to supplement the ground well water. The only real salvation will be rain. Rain to soak the ground and enough to start recharging the ground water to make any difference. A few good years. Apparently, we are having a worst drought than the Oklahoma dust bowl. Audrey, I'm just the messenger. sanderson - "Okie Revenge" I've heard it referred to. Hoping the best for your moisture levels. And I hope deep mulch is one of the answers! If it is, all of California should consider it. @sanderson wrote: Audrey, I'm just the messenger. I know, just had to rib ya! I'm listed as anywhere from 9a down to 8a, but my experience the last 3 years anyway is that we hit the low 20s for at least one stretch in the winter. Sooooo, no beans, watermelon, pumpkin or..... for this girl! Maybe these are for the Coastal areas?? This region has a wide range of Zones so one has to plant accordingly. @NHGardener wrote: sanderson - "Okie Revenge" I've heard it referred to. I've heard of people being threatened with fines for watering too much, when all they've got is really good mulching, but I wonder how often that really happens. That would be the system really shooting itself in the foot! Beans can produce so fast, though -- planted now, you could start harvesting in the beginning of October. That's already too late for you? As a matter of fact, I planted Kentucky Wonder and Missouri Wonder about 10-14 days ago in an older bed and they are almost to the trellises. They almost look picture perfect! I actually already have lots of beans planted including in my greenhouse (to extend them). I pulled up a lot that was growing in there last night and am planning for my fall/winter harvests. I have to think about what I want to grow and get it planted now. I planted a lot of lettuce starts yesterday, some radishes, some onions, cabbage and chinese cabbage. I pulled up a tomato in my greenhouse that has been producing for 18 months! It gave me probably 50-100 lbs of tomatoes. It was amazing, but finally spent! i8 months is a long time! Congrats. We are headed out to Pismo Beach and won't be back until Thursday night. DH wants to ride the dunes. I've quit that activity to spare my back for gardening and grandkiddies. There are 3 good places I love to eat, Italian, fish and Mikes or Bob's, something like that down by the wharf. for a lighter but good meal. Corn and beans are sprouting in the TTs. I just hope everything is in decent shape when I get back. Worry, worry. That's pretty great. Did you keep any seeds? It's funny on the tomato. It was from a pack of roma tomatoes I bought at a nursery but it wasn't a roma. I have a couple of the tomatoes still left in the kitchen so keeping some seed is a good idea. It wasn't anything special just a generic tomato but it survived aphids several times, some black mildewy attack in the moisture of the winter. Nothing would kill it, LOL! Cherish, cuddle and name those 2 Romas. It would be a neat experiment if you grew a couple plants next year from these seeds. "Audrey's Perennial Genetic Tomato." @sanderson wrote: Cherish, cuddle and name those 2 Romas. It would be a neat experiment if you grew a couple plants next year from these seeds. "Audrey's Perennial Genetic Tomato." Or 2, or 3 . . . I got a Black Krim to over-winter last season. Cut it back, cover it, and protect it from the cold and you may get lucky. I checked what remains of said tomato plant and the suckers are too small to take off just yet - only 5-6 inches and one set of leaves. I'll check back in a week or so. They can stand temps down to 28 degrees if you keep any frost from forming on them. My greenhouse will do that, so I'll have fresh tomatoes again all year around. I have one of these plants growing outside in my SFG table top. I didn't think ahead when I planted it. Where it is there is no way to protect it from frost as it's supported by a metal grid trellis that will conduct the cold through it. DARN! Oh well, live and learn! I think tomato clones are a good way to increase your stock and to make sure that they run true to the parent (sister or brother tomato.) Maybe that is the only way if the original is not a heritage plant. I also cleaned up my cherry tomato in the greenhouse today and will start pruning it back for the winter in a month or so. I have one I planted in a pot that I "think" is a snow fairy *deep sigh* When will I ever realize I cannot depend on my memory for these things?!!!! I have, I think, 4 types of lettuce and some spinach growing in starts. I have to get my hubby to go into our sea containers and find some shelving units for me to use in the greenhouse for things like lettuce that doesn't get large. I plant my seedlings to a spacing that is equivalent to a 4" pot so that they can grow undisturbed until I set them out at a good size. I even grow all my squash like this and they transplant perfectly. Virtually nothing I transplant has any shock or setback at all. This won't work for those who find space at a premium but I thought I'd share. Recently I've started covering my seeds with a thin layer of straw. In our super hot and dry climate the straw helps hold in the moisture the seeds need and I'm not having to water several times a day. It also absorbs the force of the water and my seeds are staying where I planted them. I use a long wand sprayer that has no adjustment to force. It's fairly gentle but in the past at times my seeds have ended up in a pile where the water runs to. Also, seeds like lettuce that should have no business germinating in 106 degree temps germinated virtually 100% last week using this method. Perhaps the light weight insulation and moisture retention of the straw? These are radish seeds started 10 days ago. 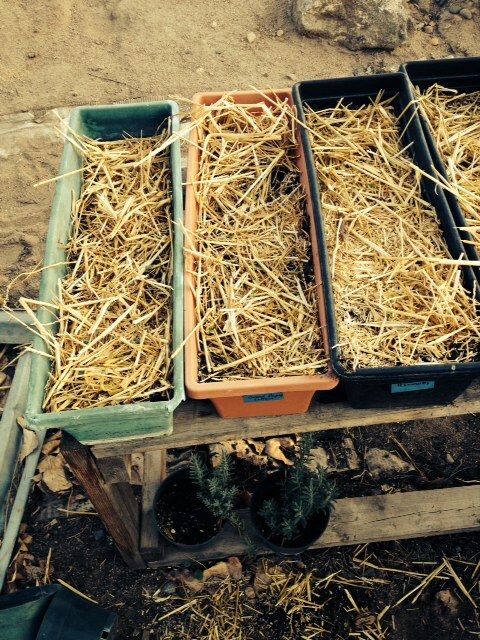 Audrey, Have you just recently started using straw as mulch in the boxes/containers? I know you have other gardening methods so I just wanted to focus on its use as mulch. I'm getting tired picking pine wood chips out of the MM when I need to add more compost mid growth. The tulle cut-to-order is okay for round pots to keep the chips off the MM. But it is a pain to lift up the tulle with chips in various squares to top dress, especially for 9 or 16 per square plants. I need to buy a bale of straw for the upcoming new compost pile so I will have some left over. Here's the SQ corn, DT beans and a paltry few soy beans in the TT. I put down a layer of straw- about 2"- and let it mat down after watering a few times, then throw on the chips. That way, when I 'm replanting, I can carefully pull up the mat and the chips together. It makes it a little bit cleaner, but there always seems to be a few chips that escape. Yardslave, that's a great idea. I'll start doing that. I have left over straw so that's why I'm using it on them. 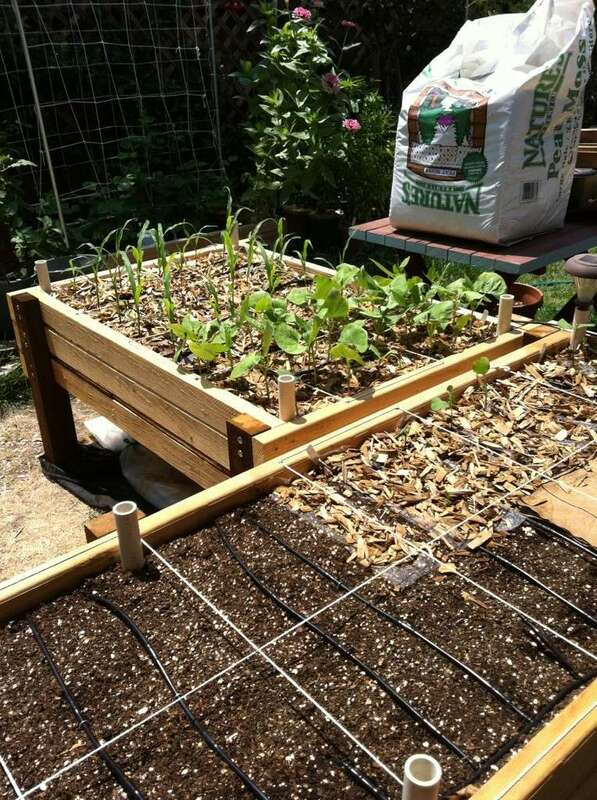 With seedlings, it's easier for them to make it up through the straw, then when I plant them in their final home I add the wood chips around them. I am experiencing absolutely no issues from the few stray wood chips that get into my Mel's mix, so I don't spend a lot of time worrying about it. I have a bucket that I lift off the chips in a square and place them into. I add my compost, plant my seeds and then have been putting the chips back down. I'm going to start putting the straw down until the seedlings come up and are large enough then replace my wood chip layer. 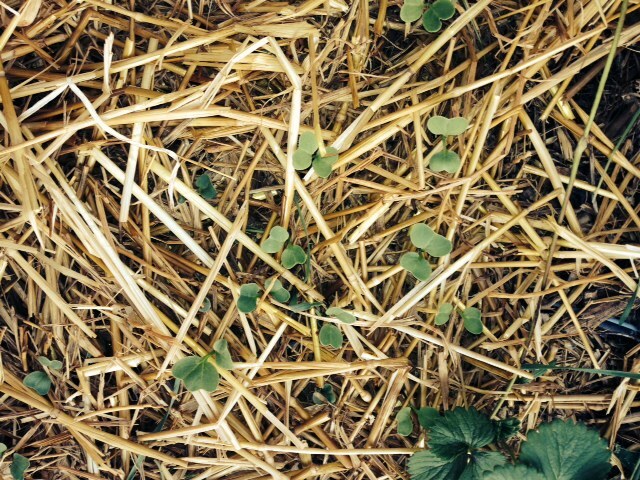 One nice thing about using the straw after planting a square is that I don't forget I planted it! It stands out from the rest of the squares so I know it's filled.